Twenty years after the Earth Summit, the United Nations Conference on Sustainable Development (UNCSD) will take place in Rio from 20-22 June, 2012. For two decades, peoples movement have worked hard for social, economic and environmental justice but yet the global economic system only resulted in a billion people starving from hunger. The gap between the rich and poor is widening with 70% of world’s resources enjoyed by top 20% and those in bottom quintile get only 2%. Climate justice could not be achieved because the rich in the North and the South do not want to change their life style and target to stop loss of biodiversity failed. Twenty years ago, with a view to the implementation of Agenda 21, some hope was raised that the road to poverty eradication, social justice and the protection of the environment could be built. Now, in the run up to the Rio+20 Summit much, if not all hope seems to evaporate. The so-called zero draft with the title “The Future We Want” that is the declaration of the Heads of States and Governments is certainly not for the prosperity of the people. Governments do not seem to be willing to address the various crises, created by the failure of capitalist system resulting in increased poverty and food crisis, the climate crisis, the resource crisis, the financial and economic crisis and the crisis of global governance. Rather they want to pursue the green economy in the context of sustainable development and poverty eradication, which is a deceptive notion to legitimise profit making, using nature as the basic resource. The zero draft’s core elements keep hold on the existing economic model. The current economic models pursued in the name of efficiency and economic growth, but in fact driven by profit and greed, have resulted in unprecedented levels of poverty, exploitation of natural, resources, inequality and food insecurity, which disproportionately affect women. The draft widely ignores social justice, human rights and eco-justice but opts to grow and to expand the existing economic model, greening it and transforming all ecosystem services to commodities and market products. Green Economy, which is the core concern of the zero draft, keeps hold of the existing exploitative model of economic growth. It fails to take into account that even the greenest economy imaginable at some point will clash with the natural resources the earth provides us with. The Green Economy as outlined in the zero draft seems to be nothing more than the greening of the existing economic structures. Thus social inequalities, pertinent injustice and inequity, the power of few on the powerless many are left untouched. The concepts of human rights and eco-justice seem to be unknown among governments. Thus, core issues of the debate referring to sustainability and sustainable societies are not reflected in the zero draft. Sustainable Development Goals in the framework of a Green Economy, as proposed in the zero draft, are not a useful tool. 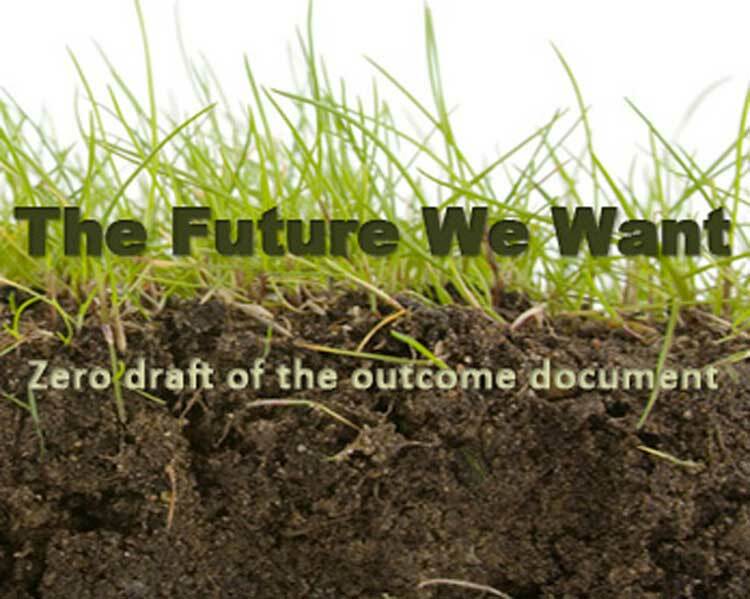 Embedded in the Green Economy concept as pointed out in the zero draft, they can neither serve as an anchor nor as a goal for a path to sustainable societies. The concept of Green Economy is blind with regard to imbalances of the World Trade regime. According to the zero draft, trade liberalisation is one of the keys to sustainable development. This ignores the need for policy space that governments can make use of for regulating the national economy towards sustainable development. It also ignores that the model of trade liberalisation pushed for by developed countries in the World Trade Organisation and in bilateral agreements is part of the roots for poverty, ecological damages, and severe injustice. Concerning food security and agriculture the zero draft fails to address the major tasks set by the food, financial and environmental crisis. The model of sustainable intensification is just greening the current way of agricultural production which has dramatically failed to feed the worlds hungry, to stop the loss of biodiversity, climate change, land degradation and desertification in the last 20 years. According to the zero draft, business has to be seen as a main engine on the road to sustainability. This mirrors the tremendous influence business has gained on political leaders and decision makers. At the same time it ignores the countless ecological and social damages multinationals are responsible for in the last twenty years. It also ignores various models of alternative economies that have been practised for years. Economic growth can no longer be the primary goal that anything else has to serve. If Rio+20 shall be a success, it will have to subordinate private economic interest based on profit and greed to human rights, social and ecological justice and a life in dignity for all. Ownership and control of natural resources and means of productions should remain embedded in communities for their livelihood sustainance. For this equity as well as integrity of nature has to be at the core of the Rio+20 Conference. We urge governments, in the further discussions and negotiations to revise the draft declaration. The world and especially the many poor and marginalized people earn and have the right to a political commitment of their governments that is more in accordance to their needs and concerns than the present zero draft. Governments must show their commitment to the democratic rights of people and thereby come up with a people-centred declaration.